Alas, The King’s Head in Deptford has long ago been demolished. Which is a shame because up until 1944 it was there, in Church Street. And in its time, it served jolly good food and brought those of differing opinions together to laugh and talk and forget their differences. I know this because Samuel Pepys happened to meet a few acquaintances there, in the dark November days of 1665. Captain John Taylor assembled the company, Chatham’s former master shipwright who had gone solo and made a creditable living building decent ships at Wapping. He invited Sir William Batten, the MP for Rochester and Master for Trinity House, the organisation responsible for lighting the sea for mariners in British waters. And also in the company was the man Pepys styled “a talking, bragging, bufflehead”: Sir John Robinson, a barely literate king-pleaser by Pepy’s account. The pair came fresh from the hunt and brandished a hare for the cook-pot. And they talked of nothing but hunting. Pepys tells us:” They…brought in a hare alive and a great many silly stories they tell of their sport, which pleases them mightily, and me not at all, such is the different sense of pleasure in mankind”. It’s one of the oldest tricks in the book: throw a great big feast and even sworn enemies must sit and sup side by side. No point in squabbling, is there, when there’s a sumptuous meal laid out for your delectation? Thus, 64 years after Christ, Tigellinus threw a banquet for the terrifying Roman Emperor Nero. Not only was the food great, it had a fabulous gimmick: it was set aboard a great raft on a lake. The Medicis celebrated the alliance of Marie de Medici with Henry IV, the King of France with lavish sculptures of ice and sugar on the tables. Food can make us forget our troubles almost entirely. Outside the walls of Paris in 1880, the Prussian armies might be poised to invade; but inside Monsieur Bonvalet, the mayor of the third arrondissement, held a Christmas party to remember at Noel Peter’s restaurant in Paris. Its gimmick? With no meat left in Paris and a zoo full of animals, it was the zoo creatures who formed the menu. Including consommé de elephant and kangaroo stew, the menu on its own makes a conversation piece. Once the food is in front of us, hosts are not above including something to make the party go with a bang. And when your guest is the Holy Roman Emperor, such a trinket would have to be spectacular. Cue Hans Schlottheim’s incredible exploding automata of 1585. I say exploding. It sits intact in the British Museum, having survived the last four centuries to amaze sucessive generations. 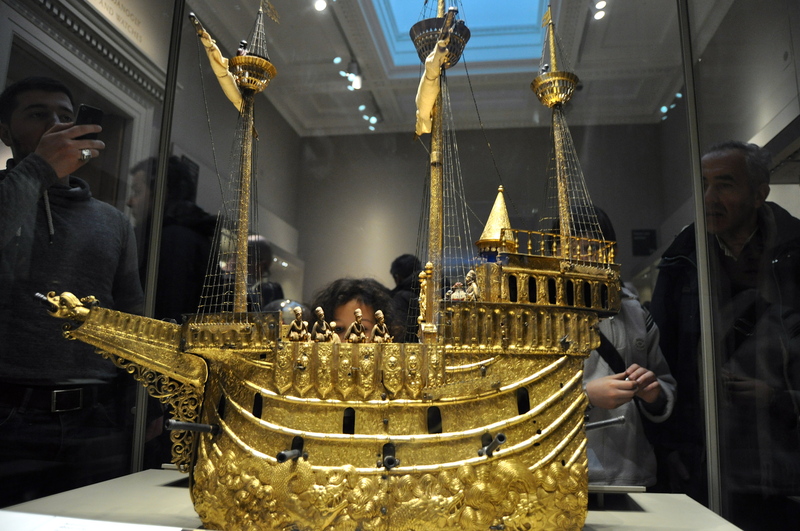 It is a great golden model of a galleon, and its purpose was to announce banquets at court. It would start amid the hubbub of all the dinner guests, with drums and music which played from deep within its hull. And a little procession of musicians would travel across the deck. And then, in front of an incredulous audience, the ship would begin to travel across the table. Finally, just in case anyone had not yet looked up from their goblet, the ship would fire a large cannon on its decks, setting off others around the hull, so those absorbed in conversation would jump out of their breeches. I imagine it was highly effective, and no-one braved the cannons to ignore the Emperor’s feast any longer. These days it has broken; but it still draws admiring glances from passers by. I wonder if it will ever grace another dinner party? Posted in Quirks of HistoryTagged 1880 Siege of Paris, dinner parties, food, Holy Roman Emperor, Medici, NeroBookmark the permalink. As usual, a perfect selection of gourmet titbits in this post. I think all those who contributed to the demollition of The King’s Head should have been recycled as dogfood before that happened. Surely it is not beyond modern capability to repair that wonderful ship? Even for just long enough to make a video of it in action? It would be lovely to see, wouldn’t it? I feel a tweet to the British Museum coming on. Can I lend you a hadada ibis to give it with a lot more force? I don’t remember seeing this at the British Museum, but I am sure that I missed a lot. I like these interesting mechanical devices. They were especially effective in a time when they didn’t have too many moving devices like this. Don’t give me ideas, Roger 😀 I shall be up in court in no time for menaces to managers. Un petit de trop, Lou? Love the photos, Kate… and the word ‘bufflehead’ – one I’ve never heard of before! I’m hearing a lot about eating different animals of late – from giant tortoises, now your zoo animals. Happy April! And you, Tom. Play any pranks today? And an amazing golden galleon! Clever old Pepys, eh, Nancy! And that galleon is incredible, isn’t it? Out of all the meats I’ve eaten, elephant is my least favourite! Do you know, I just knew I would ahve one commented who had actually tasted elephant, Tandy. Remind me never to try it! Like others, I had to look up bufflehead – a bird. Having seen the devastation that tusk hunters are bringing to the great mammals, I’m having trouble with the consommé. I think my boys would love the galleon though. It is gorgeous. And the consommé de trop, I agree. What a conversation stopper that must’ve been. 🙂 I’d spend the whole meal staring at it, waiting for it to go off. I wonder anyone could relax to eat their divine Holy Roman food, Andra! I’d accept an invitation to anyone’s dinner if this marvelous little ship were in the offing. Surely it was the talk of the town in its day. I expect you’re right, PT. I’d do much to wangle an invite to see something like this! Yes, poor souls. War is never a nice thing. I looked at that ship and thought of Felix. I bet if you could have hidden it under your coat and taken it home for a day, your son would have had a blast with it literally and figuratively. Alas, Lame, I should have brought a bigger coat. Though I think that to take this away I might have had to do that Mission Impossible hanging -from-the-ceiling-in-a-black-catsuit thing. Now that’s impressive. You’ve related what is proof to me that fact is indeed stranger, and much more fascinating than most fiction. I’m appalled at the eating of the zoo animals, but what a story! I know. A strange post today, Debra. Wow, this is a beautiful and fascinating post, but the elephant thing really made me sick. Yes. War is never pretty. Felix was delighted by the photos and your description of the ship. Thanks for taht this Sunday morning.